A Libyan air force jet has carried out two attacks on Maitiga air base in Tripoli, the Libyan capital's last functioning airport. The strikes hit an area near the runway without damaging it, but caused some damage to nearby civilian homes. The coalition of militias that controls Tripoli called it a "provocative" move by foreign-backed forces. Local media reports said flights were initially redirected to the city of Misrata but later resumed at Maitiga. 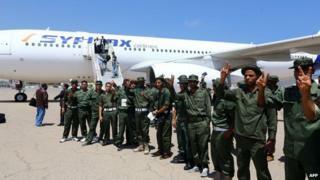 Airlines have been using Maitiga, a military air base, since July when fighting caused severe damage to Tripoli's main international airport. The head of the Libyan air force, Gen Saqr al-Jarrushi, told the AFP news agency and local media that his forces were behind the air strikes. Gen al-Jarrushi is loyal to ex-general Khalifa Haftar, whose forces, supported by the Libyan army and air force, have been fighting Islamist militants in eastern Libya. Meanwhile, the prime minister of Libya's self-declared national government in Tripoli, Omar al-Hassi, says that his government had been open to dialogue with their counterparts but would now be pursuing a policy of war. "We are now facing an enemy that has a lot of weapons and has support from regional powers and unfortunately elsewhere in the world who are providing them with weapons and experts," Mr al-Hassi said in response to the strikes. A commander of the Libya Dawn militia coalition, Salah al-Berki, called on "the revolutionaries in Tripoli to maintain all their positions in their bases". He said those who tried to destabilise Tripoli would be met "with an iron fist". Mr al-Berki said the ex-general's forces were also "backed by foreign governments". Tripoli has been taken over by Islamist and other militias, which have set up an alternative government to the elected parliament based in the coastal town of Tobruk in eastern Libya. Rival political factions - including militias that have refused to disband since the overthrow of Muammar Gaddafi in 2011 - are battling each other for control of Libya.